Katie received her Bachelors degree in Marine Biology from UNC-Wilmington and her Master of Arts in Teaching from UNC-Chapel Hill. She began her career in ag-biotech as a plant genetics scientist in Research Triangle Park. After she obtained her masters degree, she taught high school science classes in the NC public school system as well as private home school instruction through UNC-Chapel Hill. At Clinical Tools, Katie is currently focusing on the Obesity Tx Challenge project. The goal of this project is to produce case-based simulations to engage medical students in an interactive curriculum, preparing them for their role in diagnosing and treating patients with weight issues. 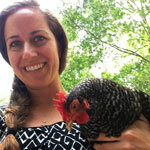 Katie has a love for permaculture landscape design as well as vertical aquaponic systems. Her little minions include a daughter, a dog, two cats, and a chicken.